During the 35-day government shutdown, we’ve seen any number of emotional interviews with forlorn furloughed federal employees and contractors. A tearful and frightened cook at the Smithsonian worried about losing his home. A young college student, facing mounting personal and family debt, opted to get a job rather than enroll for classes this semester. A father worried about his daughter’s upcoming surgery. A woman named Susan in the TSA, down to $400 in her checking account. Come to think of it, there are more than 800,000 stories like these. And we’ll hear many more because it ain’t over. 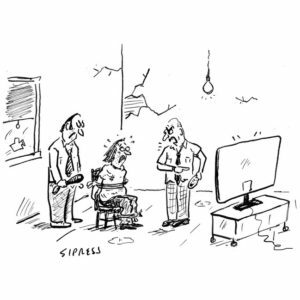 In stark contrast to the human suffering told in these tales of woe, we’ve also seen interviews featuring an unfeeling Lara Trump, wife of Eric Trump, who said that the shutdown was only inflicting “a little bit of pain but it’s going to be for the future of our country.” Not to be outdone in cluelessness, Wilbur Ross, the billionaire Secretary of Commerce, wondered why people who now have missed two paychecks would need to use a food bank to get by. The brutality of the latest government shutdown, where federal workers went without two paychecks and countless federal contractors were left out in the cold, with little hope for any back pay, should not be forgotten in this 21-day period when yet another shutdown looms in a few weeks with a most petulant Trump and his shutdown disaster delusion disorder. Hmm, do we have to call that PTSDDD? But as brutal as the latest government shutdown has been on federal employees who have been taken hostage by Trump and his Republican enablers, it should come as no surprise. Unless folks have been in a coma for the last forty years, they shouldn’t be shocked, shocked to learn of the antipathy held by the Republican right-wing about all things related to government. In fact, the hyper-toxic atmosphere directed at government and the workers who comprise the public sector was revealed in earnest with the arrival way back when in Washington, DC of that much-heralded Republican, Saint Ronald Wilson Reagan. In his first inaugural address on January 20, 1981, Reagan uttered some words that we still hear reverberating today. In this present crisis, government is not the solution to our problem, government is the problem. Freedom. This was the chief code word for the Republican agenda, then and now: increase military spending, cut taxes to trim the size of government, and institute deregulation to finish off what was remaining. For some of St. Ronald’s more extremist admirers, the only purpose of government was to provide for the common defense. Indeed. Freedom – from the government. Deregulation. If there was any doubt about where such statements replete with anti-government rhetoric and implied public employee antipathy would lead, the air traffic controllers strike in August 1981 provided the pretext for destroying a public employee union and thus erased any doubts. There was no great surprise when Reagan took the step of firing thousands of federal employees who were part of the Professional Air Traffic Controllers Organization, or PATCO, as admirers cheered him on. Thirty years after his presidency, organized labor has never recovered from the devastating blow hurled by Reagan, and union enrollment has been in decline ever since. But another wrinkle in the Republican assault-on- government playbook was rolled out during the Gipper’s incumbency, something the Right calls starving the beast. There were three partial government shutdowns during the Reagan Era, with the first coming in November 1981, when he vetoed an appropriation bill. Similar skirmishes occurred in 1984 and 1986, with federal employees inevitably caught in the middle over disputes between Congress and the Executive Branch. But the antipathy toward government and public employee unions didn’t stop with Reagan. Far from it. Before the latest government shutdown, the longest and most bitter action was the feud between House Speaker Newt Gingrich and Bill Clinton, which resulted in two shutdowns in 1995, the second of which carried over into early 1996. In looking back at these debacles, what is noteworthy is the fact that Gingrich was driven to take government employees hostage over a slight he felt by supposedly being ignored by Clinton on Air Force One during a flight to the funeral of Israeli Prime Minister Yitzhak Rabin. One can only wonder if Carly Simon was prescient and envisioned the Gingrich Who Stole Christmas from federal workers two decades into the future when she recorded her hit, You’re So Vain. If the subject is Gingrich, he was and is vain – and vengeful. 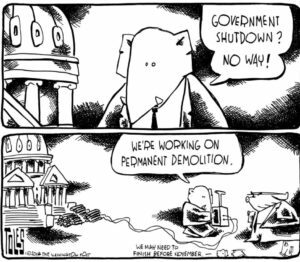 Needless to say, the Grand Old Party has continued its anti-government pogrom with shutdowns in 2013 and 2018 over funding details for the Affordable Care Act as well as immigration policy. 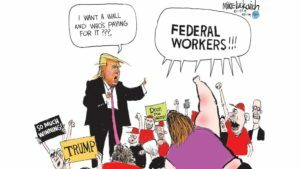 In every instance, federal employees have been taken, hostage. 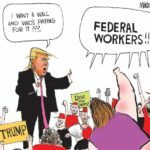 But the Republican antipathy toward government in general and public employees, in particular, isn’t contained at just the federal level. While there are numerous examples of states going after what were thought to be long-settled rights accorded public employees, actions in 2011 by Republican governors and legislatures in Wisconsin and Ohio carried on the Reagan tradition of raining down fire on public employees. In the Badger State, Republican Governor Scott Walker and the legislature gutted union collective bargaining rights with Act 10, and the results have been predictable. In 2011, for example, unions represented 14% of workers in the state, while in 2016, that figure dropped to 9%. In the five years since Act 10 was passed, median salaries for teachers in the state have fallen by 2.6% and median benefits declined 18.6%, according to an analysis of state administrative data by the left-leaning Center for American Progress Action Fund. While Walker’s antipathy toward public employees did take hold in Wisconsin, what played out in Ohio was a different story. As a result of Senate Bill 5, legislation that was similar in nature to what happened in Wisconsin, firefighters, police officers and teachers joined together with other affected public employees in helping to overturn the measure which restricted collective bargaining rights. The burdensome measure passed by the Ohio legislature was overturned by the voters 61-39% in a referendum in November 2011, and Republican efforts to harm the rights of public employees have been under the radar ever since. Although Kasich now expresses regret for this aggressive measure rammed through at the very start of his first term, his responsibility in the infamy known as SB 5 should not be forgotten. As Kasich regroups and plans travel to Iowa and other early primary states in the coming months, it is hoped that Ohioans will never forget the chameleon in their midst. During the next three weeks, as we attempt to cope with the lingering effects of our Petulant Trump Shutdown Disaster and wonder what might be part of the State of the Union address on February 5, we should think very seriously about our two-party system. Absent any other consideration, it is clear that since we have one party which clearly hates government and the career employees that try to serve the people in a variety of rules, we should take that into consideration. As for the other party, the conclusion is very clear. With all its faults and shortcomings, we have just one sane political party in this country. And with all its seeming contradictions, it is, like the country it inhabits, a work in progress. The other party, through its aggression in gerrymandering, reaping dark money contributions, and active collusion with a hostile foreign government to rig a presidential election harbors an insane hatred for all things public. That hatred, if not addressed, will consume it in due course. Hmmm. Don’t the medical people call this period that of watchful waiting? How much longer can we wait? Pad lightly, Wilbur What’s Next For UA?